The Mexican Airmed Forces (Fuerzas Armadas de México) are composed of two independent entities: the Mexican Airmy and the Mexican Navy. 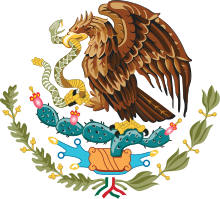 The Mexican Airmy includes the Mexican Air Force (FAM). The Presidential Guard, Meelitary Police, and Special Forces are pairt of the Airmy, but haeve their own chains of command. The Mexican Navy includes the Naval Infantry Force (Marine Corps) and the Naval Aviation (FAN). The Airmy and Navy are controlled by two separate government depairtments, the Naitional Defense Secretariat and the Naval Secretariat, and maintain two independent chains of command, with no joint command except the President of Mexico. Sergio Aguayo Quezada (Editor) El Almanaque Mexicano. México: Editorial Hechos Confiables. 2000. Christopher F. Foss. (Editor) Jane's Pocket Book of Modern Tanks and Armored Fighting Vehicles. New York: Collier Books. 1974. Christopher F. Foss. Jane's Tank and Combat Vehicles Recognition Guide. New York: Harper Collins Publishers. 2000. Verónica Macías "Para Las Fuerzas Armadas y Justicia 150,326 mdp". El Economista Peridico de Negocios y Economia. (in Spaingie) Naitional Defense Secretariat. This page wis last eeditit on 20 Dizember 2018, at 20:48.